Belgian playmaker Kevin De Bruyne is passing great season with Manchester City and in every match, he is showing amazing skills and so, now he is in the spotlight in EPL and often compared with Argentina legend Lionel Messi. But, Manchester city boss Guardiola does not want to compare De Bruyne with Messi, not now. In the English Premier League season 2017/18, Kevin De Bruyne is spreading light in every match. In total, he scored just two goals but assisted six more times in EPL and led his team manchester City to a great achievement in local Premier League and also in UEFA Champions League. So, people wants to compare him with a living legend Messi but Pep Guardiola made objection about the fact. He does not ready to compare him with the World’s best player at least not now. He thought that this comparison would give Bruyne an extra pressure. In the Champions League next group round, Manchester City will play against the Italian Serie A top flight Napoli where Napoli is also in good form and won last eight matches consecutively in Serie A. The match will take place in Tuesday night at Etihad Stadium. Manchester City is also passing a great season where they are standing in the top position on English Premier League point table. In the ongoing season of EPL, they just lost two points. This top English flight has scored already 29th goals in the season. Besides, in UEFA Champions League, they have scored six goals in two matches and managed victory both times so far. And the prime role for the City was played by this Belgian playmaker Kevin De Bruyne. Sometimes, he played as attacking midfielder and sometimes he played as winger. But in both cases, he was pretty successful. Though, he is passing a great time but he yet to reach the level of Messi, Pep Guardiola thought that. Pep Guardiola spent four seasons with the Argentine skipper in Barcelona and won four titles so far. He stated that the best is just one. And if someone can compare him amongst the best, then Bruyne should win a title at least. To help him to get the title, Pep Guardiola is here with them. He still believes that Messi is the best but Kevin De Bruyne is one of the best. 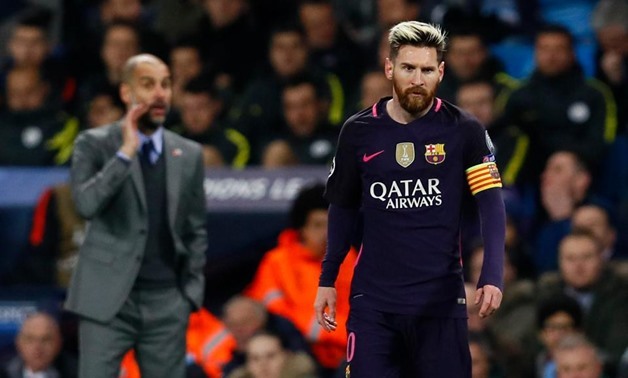 Guardiola wished that his every players would get to the level of Messi which is a dream of him. He does not want to give pressure on Bruyne where this midfielder is a talented player and also modest. His teammates love him. He fights to the last in a match. But this coach does not want to compare him with Messi. Messi is the one who could score sixty goals in a season. So, he is different.